Nate Colbert has about as big of a day for the Padres as anyone could have on Aug. 1, 1972. Over the course of a double-header at Atlanta's Fulton County Stadium, Colbert hit five home runs and knocked in 13. Four of those RBI came on a grand slam. "I was shocked when I hit the fifth one," Colbert told The Associated Press afterward. "I told the umpire at second base Bruce Froemming 'I don't believe this.' He said 'I don't either.'" Colbert's five home runs tied a major league record for a doubleheader. His 13 RBIs set a major league record. Colbert was six seasons in to a decade-long major league career that year. He made the All-Star team three times, hit over 20 home runs in a season five times and went on to a brief coaching career. Colbert's career began in 1964, signed by the Cardinals as a free agent out of Missouri Baptist University. Colbert played two seasons in the Cardinals system, then moved to the Astros system in 1966, taken in the rule 5 draft. He made the jump to Houston in April. He got into 19 games, getting no hits in seven at bats. Colbert returned to the minors for 1967, then got back to Houston for another 20 big league games in 1968. His first extended major league time came in 1969 with the Padres. San Diego selected him in the expansion draft. He got into 139 games that season for the Padres. He hit .255 and slugged 24 home runs. He then hit 38 home runs for the club in 1970 and 27 in 1971. His 1971 campaign was the first of three straight where he made the mid-summer classic. Colbert hit another 38 home runs in 1972, five of those coming on that one day in Atlanta. He didn't get to use the bat from that day again, he told The San Diego Union-Tribune years later. "I don't know how they did it," Colbert recalled to The Union-Tribune years later. "All I know is right after the game that bat was confiscated and sent to the Hall of Fame." Colbert continued with the Padres through 1974. He then played parts of two seasons with the Tigers, Expos and Athletics. He played his final game in 1976. 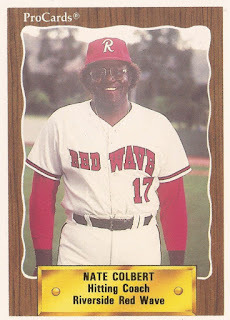 Colbert then went on to a brief career as a minors coach. The 1990 season with the Riverside Red Wave marked his fourth season as a hitting coach in the Padres system. The Padres inducted Colbert into the team's Hall of Fame in 1999. More recently, Colbert continued a weekly radio show in 2015 for Las Vegas' KBAD.